'You drive it. You define it.' That's how Hyundai wants us to view this car, their small Kona SUV. If you like cars of this kind, you're probably going to like this one because it ticks all the usual boxes in terms of style and fashionability. There's more though, to this little Crossover than initially meets the eye. Let's try it in top 1.6 T-GDi 4WD petrol form. Every mainstream brand you can think of is investing in SUVs these days. But delve into the detail and you'll find that some are taking this segment more seriously than others. Here's a manufacturer who knows just what a difference a car of this kind can make. With a product designed precisely for the needs of buyers in the fastest-growing part of this sector - that for smaller 'B'-segment supermini-derived designs. Welcome to the Hyundai Kona, tested here in op 1.6 T-GDi 4WD petrol guise.. Launched in the Autumn of 2016, the Kona's now the entry point to the company's expanded and now much wider-ranging cutting-edge SUV line-up, slotting in just below the mid-sized Tucson, which itself sits below the larger Santa Fe and Grand Santa Fe models. Together, all these cars are shortly expected to account for up to half of the brand's total worldwide sales output - reflecting the fact that on its own, the current Tucson found over a quarter of a million buyers in its first couple of years on the market. On that basis, this more affordable, more accessible Kona model is likely to become a familiar sight on our roads. On the move, it's probable that likely buyers will approve of the attributes that Hyundai has prioritised here - refinement, ease of use and the way the company's light but accurate 'Motor Driven Power Steering' system makes the car so easy to precisely place on the road, whether you're in town or threading your way at speed through corners on the open road. The 177PS 1.6 T-GDi petrol unit we're testing here can only be had with a DCT 7-speed dual-clutch automatic gearbox and an on-demand 4WD system. It's capable of 62mph from rest in 7.9s en route to 127mph. That's if you select the most dynamic of the three drive modes the auto gearbox has to offer - 'Sport' - the other two being 'Comfort' and 'Eco'. Going for the petrol 1.6 means your Kona will come fitted with more sophisticated multi-link rear suspension, with improves the slightly firm ride that characterises lesser variants on poorer surfaces. It also gets you a 4WD system with an on-demand traction set-up that'll provide extra off road grip. As for off road capability, well small SUVs like this one aren't expected to provide very much of that, so Hyundai hasn't delivered much of it here. It's the usual kind of on-demand system able to push up to 50% of torque to the rear wheels should a lack of traction demand it. A car of this kind has to evoke a reaction from you: that's part of the point of it. The Kona should do that, with its muscular toning, sensuous surfaces and high-contrast fender cladding. It all combines to make this little SUV seem a little more serious in its intent than some of its rivals - which actually isn't far from the truth. Most competitors in this segment are merely stylised versions of the existing superminis they're based upon. The Kona in contrast, is one of the few contenders in the class boasting its own purpose-built SUV platform - which is why it's one of the only ones that can be engineered to offer the option of all-electric power. 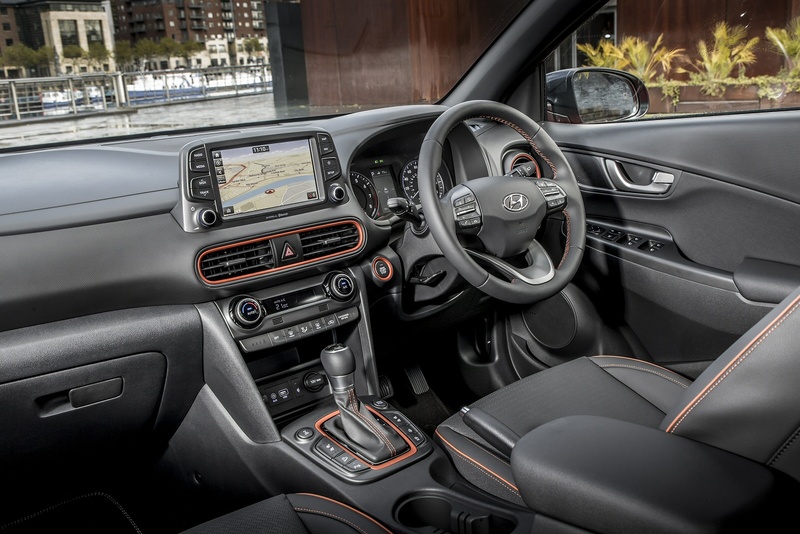 At the wheel, the driving position isn't especially commanding but the cabin feels of decent quality. On plusher models with leather trim, it can be colour-personalised too, with highlights surrounding the gearshift, the starter button and the air vents, plus the chosen colour is also replicated into the seat stitching - and rather unusually, onto the seatbelts too. Infotainment is also well taken care of, most variants getting a 8-inch 'Display Audio' centre-dash colour touchscreen. You can also connect in your handset using the 'Apple CarPlay' and 'Android Auto' smartphone mirroring. There's also a reasonably-sized 361-litre boot. So, what will it cost to buy this car and what will you get for the money? The pokier 1.6-litre T-GDi petrol Kona variant comes only with 4WD, DCT auto transmission and top-spec trim, which is why it'll require a budget of at least £25,000. 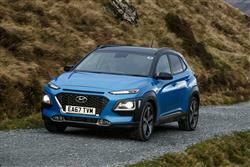 Small wonder that Hyundai thinks this derivative will account for just 2% of all Kona sales in our market. The 'Premium GT' trim you have to have with this variant gives you luxury touches like leather upholstery, heated and cooled power-adjustable front seats, a heated steering wheel, power-folding mirrors, front parking sensors, a rear central armrest and a Head-up display. Plus there's full-LED technology for the front and rear lamps, autonomous emergency braking and a large 4.2-inch colour LCD display in the instrument binnacle. You can also choose colour-coded cabin flashings in either orange, lime or red. Safety-wise, there's 'Driver Attention Alert' - which monitors your driving reactions for drowsiness; and 'Lane Keep Assist' - which alerts you if you drift over the lane delineating lines on the highway and, of you don't respond, then automatically uses subtle steering guidance to ease the car back into the right position on the road. Plus a 'Rear Cross Traffic Alert' system that uses the same radar and camera set-up to alert you to oncoming traffic if you're reversing out of a parking space. The introduction of new engine technology has kept Hyundai right on the pace of the class best when it comes to efficiency and carbon dioxide emissions. The 1.6-litre T-GDI variant delivers 169g/km and 38.7mpg. Fuel saving technologies include Integrated Stop & Go (ISG), low rolling-resistance tyres, an alternator management system (AMS) and a drag-reducing 'active air flap' in the front grille. All of this is aided by a slippery drag coefficient and in the top petrol variant, the 7DCT auto gearbox provides an improvement in fuel consumption and CO2 emissions of up to 20% compared to a conventional six-gear automated transmission. As for servicing, well your Kona will need a garage visit once a year or every 10,000 miles, whichever comes sooner. If you want to budget ahead for routine maintenance, there are various 'Hyundai Sense' packages that offer fixed-price servicing over two, three or five-year periods. You can pay for your plan monthly and add MoTs into the three or five year plans for an extra fee. If you�re looking for a new Hyundai Kona 1.6T GDi Blue Drive Premium GT 5dr 4WD DCT Petrol Hatchback for sale, you�ve come to the right place. 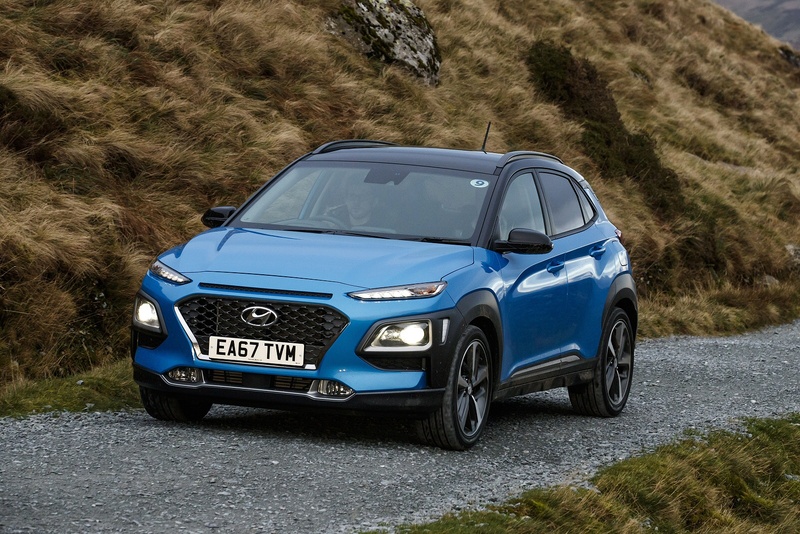 At Bristol Street Motors we don�t just have the best Hyundai Kona 1.6T GDi Blue Drive Premium GT 5dr 4WD DCT Petrol Hatchback deals, we also offer friendly advice and help with all your enquiries to ensure your buying experience is a happy experience.